I was born on the 4th of July. My birth was a signal that I would stick out in some fashion. Growing up, I lived in the shadow of my over-achieving, do-it-or-die-trying, Capricorn mother. She herself was the daughter of a Capricorn with a similar stubborn drive. And while my mother seemed to pick things up and become instantly adept, I remained in the background, secretly wishing I could do the same. The truth was that I just hadn't found my medium. In elementary school, I started stealing small hanks of embroidery floss from my mother's cross stitch shop and using them to make simple friendship bracelets. Later, I would tinker with her needlepoint kits, learn macrame, and even teach myself to crochet. From then on, I taught myself every medium I learned. embodying the fears and struggles of another in my own heart. My love of creating lay dormant. It functioned solely as a fun diversion, a simple hobby that relaxed me and nothing more. Nearly a decade ago, I received fateful news - news I went into complete denial about, news that changed my life, news that eventually set in motion my freedom from the stigmas of the past. My mother, Stephanie Wheeler, had passed away. Losing someone you were once so close to, and even idolized, at a fairly young age is traumatic. It was one of the most significant moments of my life. My own mortality set in. I realized how precious life is and that I don't have time to squander it on things I don't want. Subscribe now for personal, up to date news on my latest & greatest. 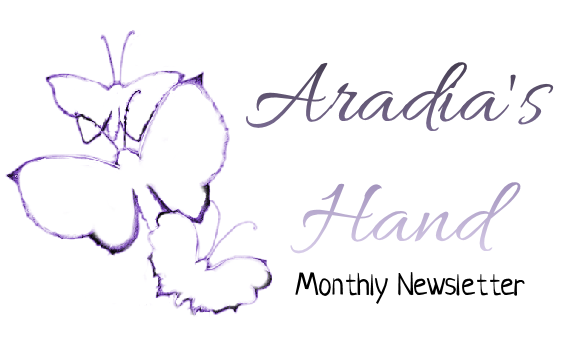 Aradia's Hand is a place to buy spiritually-inspired accessories, jewelry, and decor for yourself and your home. I cater to Gothic, Bohemian, Eclectic, and Pagan styles but am happy to make anything that speaks to you! Everything I make hold a piece of my energy and is made in sacred space with the highest good. I cleanse and bless everything I make with Reiki. I want to help bring handmade back to the public. For people to again have a connection and appreciation for their possessions without being a slave to them. One of the bottom lines of my business is to put the humanity and heart into what you own with awareness. Aradia's Hand was inspired by the talent and drive of the late Stephanie Wheeler and Cottage Crafts. So, like the 8 of Swords, with the blindfold removed, I realized I was no bound woman and that I could move on and forward, albeit carefully. And a few years later, I had launched my own dream, Faith Works, in honor of my mother. Now, three years after opening my online doors, you can find me selling as Aradia's Hand, with my mother always present in my mind. I came from a world where "you can't be you", or too diverse, or multiple unrelated things. You have to fit a stereotype. It was like the world was black and white, but I was in full Technicolor. I was, and am, just not the type of person you put in a box. I'm a writer, an artist, a crafter, a healer, an intuitive, a teacher/mentor.... I am She of Many Names. I'm an intuitive, an empath, a Moon-loving Priestess of the SHE Principle. I am spiritually-inspired and take the road through the trees to the stars. I'm the girl with that tattoo. I'm the one who gave you a double-take and deja vu. I'm the lovely, looney Lunar Bird; Crabby Lil Miss clicking her claws and scuttling back and forth. For all these many parts of me, you'll only see the illusion of your own Ego for above, unto, and ultimately, I am one thing: ME.